The Duo National Championships are a grand title but because of an increasing reluctance of owners to travel we have seen numbers of boats dwindling over past years. So we now hold this event at the two clubs with the most resident Duos whose owners like to race – Hawley Lake, and this year Cransley SC. So on a bright and breezy Saturday (August 1st) it was rather disappointing that only 4 boats took part. This was partly because some Duo owners chose to sail single-handed Comets rather than their Duo, as the racing coincided with a Comet open meeting. 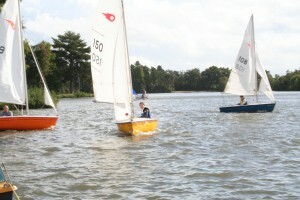 However the 4 boats which did take part enjoyed some good sailing in a freshening breeze which was gusty at times. There were two boats sailed double-handed – Stephen Linton with his wife Lorraine as crew (sail no 150), and a new Duo sailor, Peter Stein, with an enthusiastic young crew in William Grantham (sailing no 103). The other two Duos were single-handed, with John Linnell (90) and Nigel Ford (93) at the helm. John is an experienced Duo single-handed sailor, this year with a ‘new’ boat, and he handled the strengthening wind much better than the rest of us, winning all 3 races convincingly. Peter and Nigel had a very close first race, with Nigel narrowly having the better on the water, but Peter and William taking the second place on handicap (we handicap single-handed sailors by 25 PY points). In this first race Stephen and Lorraine were convincingly last. In race 2, John once again sailed away, but Peter suffered an unfortunate collision with one of the Comets and had to retire (not Peter’s fault, I gather!). 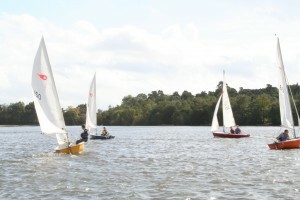 As the wind increased, Nigel suffered a capsize allowing Stephen and Lorraine to finish second. And in race 3, with John showing us all how to sail in strong winds, both Nigel and Stephen set out but decided after 2 laps that discretion was needed and retired. So the overall result was John Linnell a convincing winner, Stephen & Lorraine second, Nigel third, and Peter with William fourth. 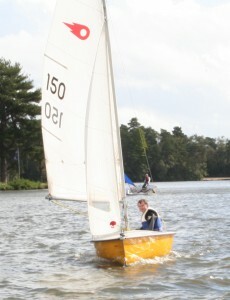 Peter is now a convinced Duo sailor so we look forward to competing with him again. And many congratulations to John who was clearly the best Duo sailor on the day.